The perfect introduction to South America – spending 3 days in Buenos Aires! Tango and steak, Malbec wine and colourful houses, sprawling theatres and tree-lined avenues; Buenos Aires is a city that truly captured our hearts! After almost three years in Asia we flew to the other side of the world to take on a new adventure. Our interest in South America had been growing more and more every day, and we couldn’t wait to finally get the chance to explore it. Our first port of entry and subsequent introduction to South America was Buenos Aires, Argentina’s eclectic and vibrant capital city. We flew from Australia to Argentina via Auckland, which is of course a huge haul. We did it in comfort though, by flying with Emirates from Sydney to Auckland, then Air New Zealand to Buenos Aires, with a few hours spent in the Air New Zealand Lounge in Auckland. No jetlag for us when we got to Argentina! A quick search of things to do in Buenos Aires quickly revealed a whole smorgasbord of activities, and it’s quite easy to get overwhelmed when trying to choose what to see. We’ve now spent a total of 4 weeks in Buenos Aires, and it’s still not enough to fully explore a place of this size. Still, that doesn’t mean you shouldn’t try on a shorter time frame! If you’ve only given yourself a limited time in the city it’s important to prioritise what you want to do, and where you want to stay. This article will give you a great understanding of what to see on a 3 days in Buenos Aires itinerary. The first thing you will want to do is pick which neighbourhood in Buenos Aires you want to stay in. This place is really quite different to other cities in the world, and being in the right area will make all the difference. We had heard a lot about how immense Buenos Aires was, and after trawling all the information on the TripAdvisor forums we discovered that the neighbourhood we stayed in would have a huge impact on our experience. There’s Palermo Soho and Palermo Hollywood, Recoleta, San Telmo, La Boca and a whole range of others that sounded interesting, yet hard to narrow down. 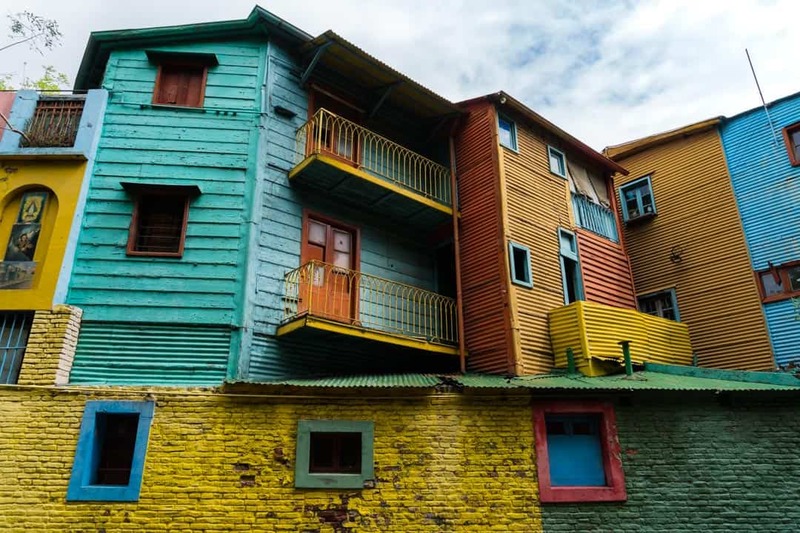 La Boca is most famous for the colourful buildings and tango shows, but after chatting to locals we realised that it’s actually a place that’s better to visit rather than stay in. It can get quite sketchy at night. The first time that we visited Buenos Aires we settled on San Telmo, based on someone’s recommendation that it was a bit more relaxed, hip and full of character – exactly what we needed! San Telmo is also famous for its exciting street fair that happens every Sunday. The second time we visited Buenos Aires we opted to stay out in the hipster hood of Palermo Hollywood. Trying to decide which neighbourhood we like better is tough, but in all honest we feel like Palermo might win if you don’t mind being a bit farther out from the action. The leafy streets and wide parks and a lot quieter than what you find in San Telmo, and there’s countless bars and restaurants to hit up as well. It’s definitely more expensive as a whole compared to other parts of town, but we love it there. So much so that we even ended up renting our own apartment for 3 weeks in Palermo Hollywood when we needed to catch up on work. A man walking through a gorgeous Buenos Aires park. If you’ve only given yourself 3 days in Buenos Aires you might be quickly overwhelmed with all the things to do in the city. Luckily we’ve narrowed down some of the best activities, without burning yourself out. On the first of your 3 days in Buenos Aires, we recommend hitting up a tried-and-true activity: A free walking tour. Originating in Europe, these walking tours can be found in most major (and sometimes small) cities all over the world. The premise is always the same: You get a passionate local guide who takes you around the city for free, and afterwards you tip based on what you thought the tour was worth. Because there’s no set fee the guides go above and beyond to try and impress, so you are almost guaranteed a tour you’ll never forget. The one in Buenos Aires was no different, and for almost four hours we walked to some of the most famous sights of the city, finishing up in the Recoleta neighbourhood and the iconic Cemertario de la Recoleta. They will tell you a little bit of information about the cemetery and if you are interested you can book a tour. Besides the general tours you can also do themed ones, or focus on one particular element, such as the cemetery. 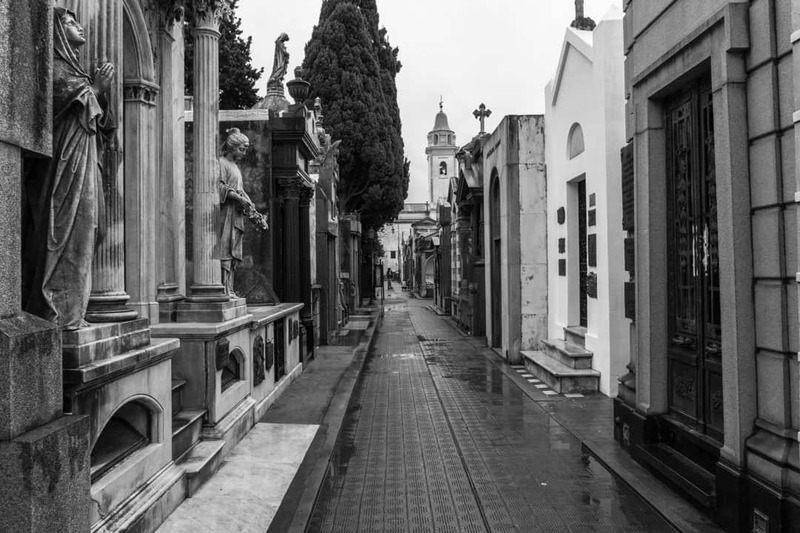 Interested in doing a personal tour of Cemertario se la Recoleta? Book through Get Your Guide. Because you’re in Argentina there’s two things you’ll want to learn more about: The first is steak, and the second is wine. The wine in Argentina is known to be some of the best in the world, and even though we love wine we really felt like we knew very little about it. That was until we did a wine tasting experience at Casa Coupage. The owner Santiago started this concept out of his own home many years ago after going from bartender to professional sommelier (wine taster). His passion for wine led him to inviting friends to his house to go through his personal collection, and he found a passion for testing certain wines against certain foods. Two red wines to test. The Malbec or the Syrah – which would you prefer? Eventually the word spread and his place got so popular he had to open a dedicated restaurant. From there he opened a second one, La Bumon, and both places are booked almost every night. This isn’t just about pairing wine with your meal. This is a proper wine experience. 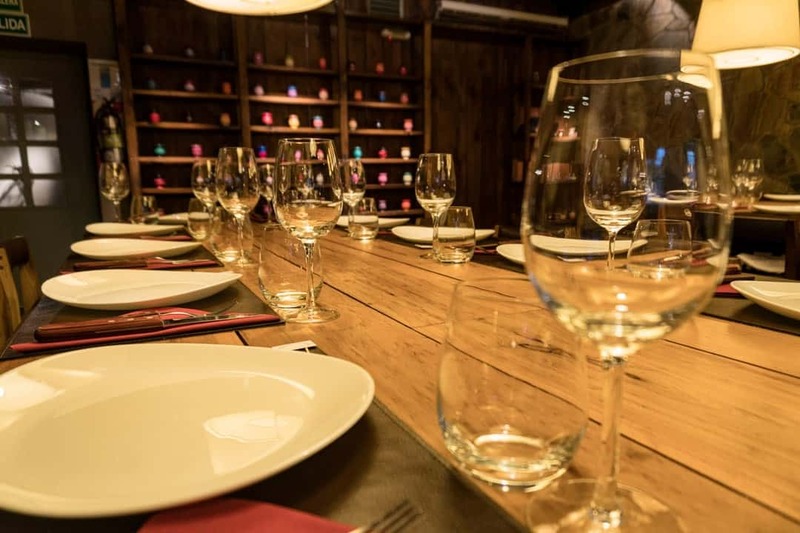 Santiago and his expert staff actually deliver multiple glasses of wine with each dish, allowing you to realise how your palette changes as the night progresses. This was our first time ever doing something like this, and it was amazing. We couldn’t believe how we would prefer a torrontes before a certain meal, but then after a mouthful the chardonnay would suddenly become our favourite. Oh, and the food…to die for! Throughout the experience a sommelier explains every grape, wine, dish and flavour so you receive an in-depth eduction as you go. You’ll leave this place an expert, and ready to taste wine all over the country. Casa Coupage is a popular place, so make sure you reserve a spot. The night we went they were actually booked out, so we did our wine tasting at La Bumon. Be prepared for delicious food! Turning to the TripAdvisor app for guidance we found a great tour activity called the “Hidden Graffiti And Urban Art Tour” by Biking Buenos Aires. With our love of street art and getting off the beaten path, this sounded right up our alley. In our opinion riding a bike is the best way to explore a city, as you can see so much more in a single day without the need for jumping on congested public transport. Plus you get to do things most people don’t have a chance to. The Hidden Graffiti and Urban Art Tour is a perfect example of this. Want to do this trip yourself? Book your bike tour through Get Your Guide. Beautiful doors in an old alleyway in the Barracas neighbourhood of Buenos Aires. On our tour we encountered some famous artists and more than a handful of sensational murals. Our guides Ray and Jackson filled us in on the backstories of many of them, and whet our appetite for more. 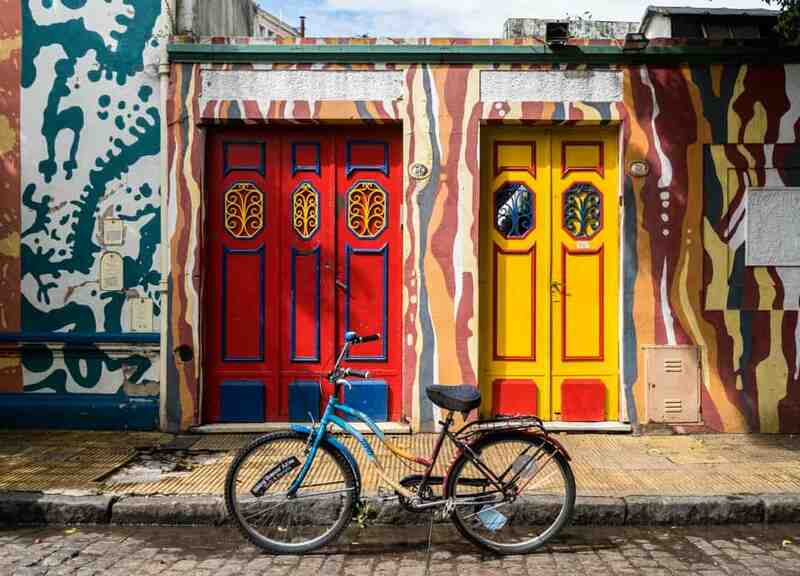 It was a perfect introduction to the outskirts of the city, and we pedalled out to the famous neighbourhood of La Boca, with its colourful tin houses, before disappearing into some secret back alleys that tourists would never stumble across. Buenos Aires has a bit of a reputation for being on the ‘sketchy’ side, but with Ray and Jackson taking charge they took us to hidden spots without putting us in danger at all. Having done similar tours in Berlin, we knew we would enjoy it. But this surpassed our expectations so much that we signed up for another tour when we returned. This time round we did their brand new ‘Beers and Hammocks’ tour. The name alone made us sign up, but there was a lot more to it than just laying around getting drunk. Now Biking Buenos Aires has some funky bamboo bikes, which are super comfortable to ride (and turn a lot of heads too). We headed off from San Telmo again and stopped off at a couple of interesting art galleries, including one where 6000 spiders were put in a room and allowed to make giant webs. Then it was back into La Boca to learn about the cultural growth of the city, before making our way towards a private artists’ residence to crack the first beer (IPA of course). Properly lubed up we started to make our way towards the river, with a stop at a replica museum to check out Michelangelo’s David. The highlight (and reason for the tour’s name) was chilling out at Neon Beach on inflatable couches, sipping on beer by the river’s edge. Chilling out on inflatable hammocks at Neon Beach. You can’t come to Buenos Aires without attending a tango show. It would be like going to Australia and missing the beach. Trying to choose the best tango show in Buenos Aires can be quite intimidating, and you’ll be forgiven for not knowing where to start. However we checked out the amazing El Querandi show on our last night in the city and absolutely loved it! El Querandi is housed in an old theatre, with amazing architecture right in the heart of downtown. The history of the building is phenomenal, and hosting a tango show there is incredible. If you go for the full package a delicious dinner is included, as well as all-you-can-drink wine or beer. Once you have gorged yourself, the show begins. What makes El Querandi so unique is that it actually takes you on a journey through the history of tango, from its early beginnings right through to the sensual rebellion of the 50s. It’s definitely worth checking out, and it might even inspire you to learn the tango yourself. Would you like to go to this show? Book here through Get Your Guide. If you end up in Buenos Aires on a Sunday, definitely spend some time in San Telmo and its awesome street markets. This is a popular tourist attraction and came about when the aristocrats of old Buenos Aires were overtaken by slaves. Their elaborate furniture ended up on the streets and sold to anyone that cared to buy them, eventually turning into the market. After the market head down to a pub called Bier Life, also in the San Telmo barrio. With a name like that, we didn’t need much encouragement to check it out. On a Sunday it will be absolutely packed. Throw in happy hour, delicious beer and perhaps a touch of rain, and it’s no surprise really that it’s so popular. For 65 Pesos (about US$4) we got two craft beers, and we settled in for a late afternoon session. A large mural in the San Telmo neighbourhood. Your last night in Buenos Aires should be something special, so sign up for the number one restaurant on TripAdvisor, ‘The Argentine Experience‘. This isn’t just your usual sit-down meal. 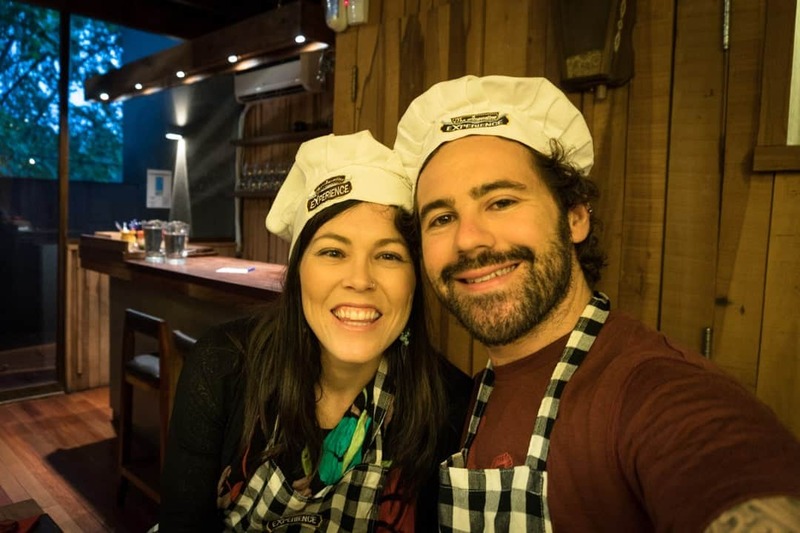 The Argentine Experience is an interactive journey, filled with incredible food, laughs, education and friendship. Straight away we knew this wasn’t going to be a typical dinner. Wearing the hats and aprons provided at the Argentine Experience. Soon we were joined by a group of tourists from both Argentina and abroad, and we settled in for the night. The owner Leon gave a wonderful introduction that stuck with us. He created The Argentine Experience after his own travels around the world. He had realised that as he got older he didn’t want to keep staying in hostels and living as a backpacker, but by changing his style and now staying in hotels he quickly found out that he was missing the best aspect that hostels provide: a social scene. The Argentine Experience was born to reintroduce this social aspect of travel. An interactive environment was developed so that inhibitions were dropped and you could easily chat with anyone and everyone in the group. Boutique wines started to flow and the staff taught us how to make our own empanadas while divulging the secrets of Argentinian delicacies. Delicious pastries made way for local tapas, and then the famous steaks made their appearance. Taught how to order like a true Argentine, the juicy pieces of meat came out cooked to perfection. The tables are set, waiting for our food and wine. Deserts followed, and the entire time our glasses were kept full with various wines from around the country. In total we spent four hours at The Argentine Experience. It was far more than a dinner, and not quite a cooking class. It was simply a splendid, enjoyable and tasty evening activity. The night ended and we headed back to town, stomachs full and our heads slightly tipsy from the copious amounts of wine that had passed around. Once you’ve picked which neighbourhood in Buenos Aires to stay in, the next step is finding accommodation. We’re going to suggest two of the best hotels in Palermo. The name is a dead giveaway – you’ll feel like home when you get here! We’ve been lucky enough to stay in hundreds of hotels around the world, and whenever we find a place that feels like home (such as CasaSur Charming Hotel in Santiago, Chile), we always fall in love. From the moment we walked into Home Hotel we knew that it was going to be a phenomenal stay. The wonderful lobby was beautifully decorated, spaced out with lounges and leather armchairs. The backyard was leafy and green, and on a summer day would be a perfect place to relax. There’s even a swimming pool, which was unfortunately closed when we were there. Our gorgeous bedroom at Home Hotel, Buenos Aires. Our bedroom was exactly what we look for in a boutique hotel – large, bright, nice areas to work, cool decorations and a comfortable bed. It really did tick all the boxes! Alesha would often just relax on the windowsill, working away on the laptop while taking in the green views. Not something you’d expect to see outside your hotel room in downtown Buenos Aires! Breakfast in the mornings was healthy and filling, with a nice variety of dishes that we haven’t really experienced at other hotels in the country. The other thing that makes Home Hotel so incredible is the evolving art gallery that is found around the property. 6 artists have temporary exhibitions here, and these change regularly. Nice to see local artists having a place to showcase their talents! We loved our time at Home Hotel Buenos Aires, and it was definitely a favourite place to stay. The downstairs lobby at Home Hotel. If you’re the kind of person that likes pure retro style in your boutique hotel, then Hotel Clasico is exactly where you need to stay! This is more like a vintage home, with antique furniture, a quirky elevator and funky hallways to add to the historic feel. The bedrooms are low-key, with more of an emphasis on subtle style than colourful decorations. The bed was of course like sleeping on a cloud. The restaurant at Hotel Clasico. If you want to kick back in the hotel rather than hit the city you can chill in their living room, with comfy chairs and reading material to help pass the hours. We also managed to sneak a peak in their penthouse suite. If you’re travelling with a group of friends or family, this is maybe the best way to stay in Buenos Aires economically. Check out the picture below! When choosing your place to stay for 3 days in Buenos Aires definitely consider Hotel Clasico. The penthouse at Hotel Clasico. This article was produced in collaboration with TripAdvisor, and some of our activities and accommodation was organised by our partnership with Destino Argentina. As always all thoughts, opinions and glasses of wine consumed are our own. Hey! thank you so much for sharing this itinerary–definitely will be borrowing a lot of these ideas. I was curious about your experience at Casa Coupage. They have an opening for dinner at the house (4 tables I’m told). The reviews seem mixed and I’ve read a few people say that the experience has changed (without elaborating). I am doing the Argentine Experience on my last night. Any other suggestions for stand out wine and food? Absolutely loved our time in Buenos Aires! Will definitely look back here for more inspiration to go back! Glad you had a great time in Buenos Aires. It a great city. Thanks Henry. ¡Hola Alesha & Jarryd! As an all-time porteño, I’d like to congratulate and thank you for this post, because it captures the essence of Buenos Aires and invites to come here and really enjoy the city. I can also suggest some lovely places in the surroundings, for anyone daring to get away a bit. Great post! We’re planning in visiting Buenos Aires earlier this March and this is a great short guide to get us introduced loved it! Can’t wait to bike around and try craft beers (beer lovers here!)! So awesome. I am glad we could help. It is a fun city. Have a great time Callie. Hi guys! Nice post about BA! Currently living here, and you sometimes forget to look at the city in the eyes of a visitor. With this piece you gave me some very good ideas on what to invite my mum on of activities when she comes to visit! Btw. awesome to hear good things about the Urban and Street Art biking your! I love street art as well but went on a horrible tour here in BA Will check this one out! AND if you enjoy street art; include Bogotá in your South America tour! Hi Rebecca, We understand what you mean. We are glad we could help you out. That is exciting your Mum is coming to visit. The Street art bike tour was amazing and a great day out. All the suggestions above were amazing. Food, wine, dancing….. how could you not love it. 🙂 We loved exploring BA. We are looking forward to returning one day. lol you can say that. We loved our experience at Argentina Experience. Very enjoyable. You would have got to know the city very well. We can not wait to return and have more time there. Happy travels.